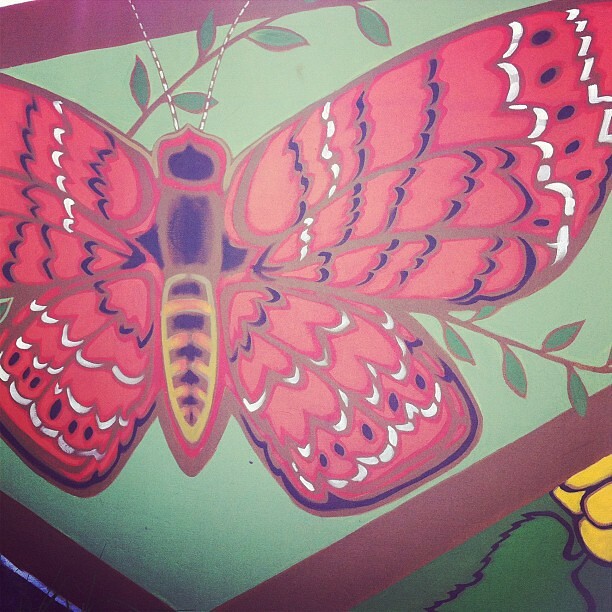 This butterfly was part of a gorgeous mural at the end of my walk this morning. It made a nice ending to a walk where I got hassled by random guys sitting in a car I walked past (why do men do this?) and also dealt with some serious wedgie issues (what is up with that?). Ugh! But overall the walk was really nice. I did a ton of cooking this weekend and I made the zucchini chips again. Even better this time around. I made them on a cooling rack on top of the pan (per my mom's suggestion) and it worked so well. Yum! I have no nail polish on my toes right now (actually for the last 24 hours or so). I can't even tell you the last time this was the case...years. My feet look so weird right now (even weirder than normal)! I've been selling stuff on the C-list this past week and while most experiences have been good, it has brought out the crazy in people. One guy emailed me to criticize my phrasing ("excellent, but used condition"). He didn't want to buy anything, just make his point. Another lady wrote to tell me that I had priced a toy $20 over what she could pay any number of people who currently have listings for that same toy. Ummmm, do that then! Also, that lady had my husband's last name (which we don't use). Weird, right? It got even weirder when I got an email about 10 minutes later from another lady (in another town) who wants to pay me the full (apparently outrageous) asking price for the same town. She has my husband's last name too. I sold a stroller this weekend. The cash was nice, but I have to be honest that I was more thankful to take the listing down and stop getting solicitation emails from my posting...for a stroller. I'm not sure what the trigger for the spam was...sit 'n stand? Is that code for something that my sheltered self is not aware of? I'm starting to plan for summer for the kids (classes and stuff) but was planning a casual (or some might say, lazy) plan as far as projects/crafts. Then of course, EJ tells me that her favorite part of summer is the art projects, so back to planning for me. I just realized I use the same detangling comb on my hair post-shower that I use on the girls every morning. So basically it's just a matter of time until one of them gives me lice. 1.) Zucchini chips - I'll have to try that. 2.) I would be freaked out by the last name deal, but that's because we have a last name that only 12 people have in the US. 3.) I don't know the code for sit n stand and I teach high school.... so. I can't take credit for your zucchini chips...the rack idea came from Rachel Ray. She uses this idea for many things. Roasting veggies and any breaded things, including breaded meats. Also for keeping what she has fried on the stove top, warm in the oven. Nothing can get soggy.